Rummy Circle always comes up with amazing promotions which will enable you to have an exciting experience to play rummy. It is an amazing platform where you can learn the basics on how to play online rummy games. It is your chance to win from the whopping double million (20 Lakhs) prize pool at Rummy Circle. This is an epic rummy tournament and it has been running in the rummy circle for the past few months. So if you are ready to be the next rummy superstar at Rummy Circle, just login and start playing today. The winner of this amazing rummy tourney takes home an amount of Rs.5 Lakhs! 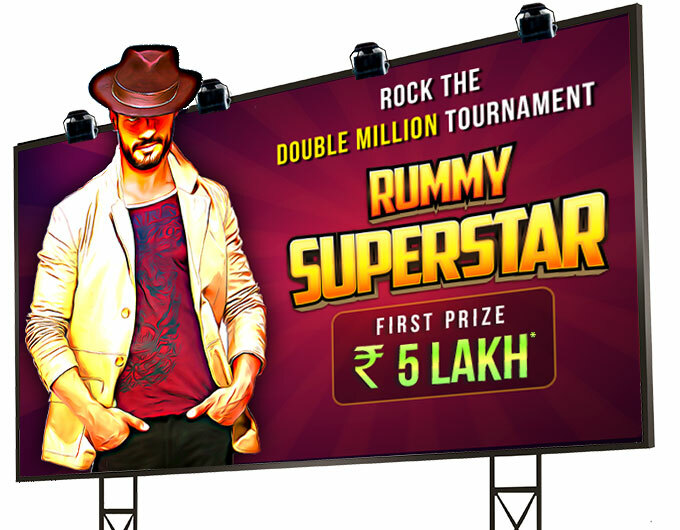 The Rummy superstar tournament is designed for the players who like to play it big. This is a premium high roller tournament to win big! The tournament is scheduled to be live on 26th February at 6:00 PM and you need to register for the tourney between 4:55 PM and 5:5 PM on the same day. The seats are limited to 225 and if you are really interested in taking part in the special superstar tournament you should consider registering before the seats run out. The entry fee for this tournament is Rs.10,000 and if you are a cash player at Rummy Circle you can be a part of this special tournament. Do take part in this epic tournament and do let us know your reviews. Comment below your suggestions on the rummy tournaments and promotions that are hosted in Rummy Circle.